In creating the Balancier Contemporain, a white gold 33-piece limited edition, Greubel Forsey imagined providing a particularly compact showcase for its exclusive balance-wheel system. Creating such a moderately-sized new movement and dial imposed the challenge of maintaining well-balanced forms and pleasing proportions, along with clear legibility and cutting-edge performance. Mission accomplished with this powerfully structured timepiece featuring all the Greubel Forsey signature characteristics. 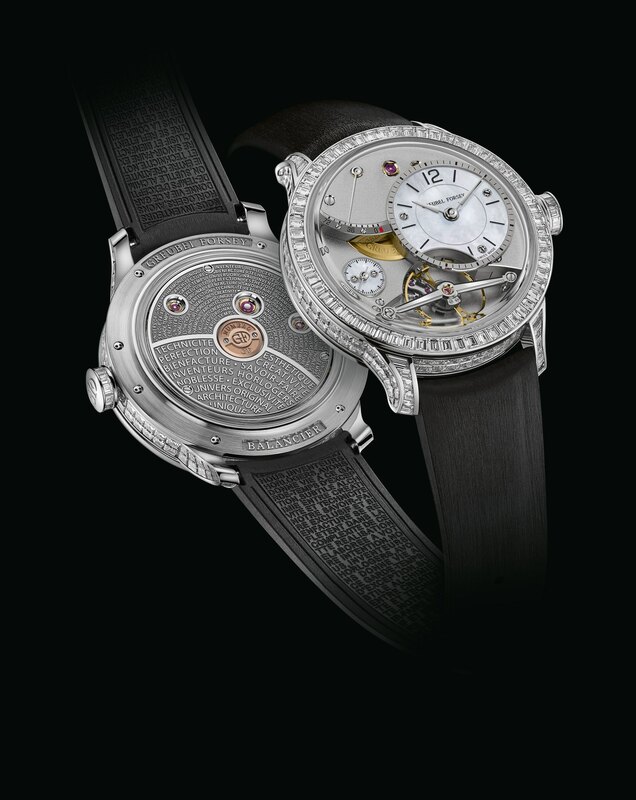 Inventor Watchmakers Robert Greubel and Stephen Forsey have made their mark on watchmaking history through a number of mechanical creations, notably the Double Tourbillon 30°, the Quadruple Tourbillon, the GMT, the QP à Équation with its Mechanical Computer, along with the Différentiel d’Égalité and the Grande Sonnerie. Artists at heart, they set the scene for these Fundamental Inventions through timepieces featuring unprecedented aesthetics, mastering asymmetry and balance to provide fresh momentum and playing with depth and volume in exploring all three dimensions. Each of these unique architectural accomplishments is crafted with extreme attention to detail with a particularly consummate skill applied to hand finishing. The result is a unique universe perfectly embodied in the new Balancier Contemporain. This highly original creation is distinguished by its 39.6 mm diameter, a first from Greubel Forsey which generally builds larger timepieces. The challenge here was not only to house the large balance wheel within a limited space, but above all to achieve optimal proportions and an attractive three-dimensional construction, as well as safeguarding the emblematic aesthetic codes of the timepieces built within the Atelier. A daunting endeavour that required several years of development in order to create an appealing and unmistakably Greubel Forsey creation. Since 2004, Robert Greubel and Stephen Forsey have devoted a significant amount of time to opening up whole new horizons for the most daring mechanical complications. They have also turned their attention to the “fundamentals” of watchmaking, investigating them in a spirit of efficiency and perfection. 2017 saw the unveiling of an exclusively designed balance wheel system, entirely developed and crafted in the Greubel Forsey Atelier just outside La Chaux-de-Fonds. The innovative balance wheel is distinguished by its large 12.6 mm diameter ensuring optimal timekeeping stability. To enable fine adjustment of its moment of inertia, the balance rim is fitted with six gold mean-time screws, recessed in order to guarantee optimal aerodynamics by reducing air friction. This results in enhanced chronometric performance and facilitates adjusting by the watchmaker. This exclusive regulating organ was initially launched in a limited edition named ‘Balancier’, within Greubel Forsey’s iconic asymmetrical case in a white gold 43.5 mmdiameter version measuring 13.94 mm high. With the Balancier Contemporain, Greubel Forsey is offering an entirely new movement within the compact 39.6 mm-diameter, 12.21 mm-high case. An original and engaging display of three-dimensional architecture, this timepiece is suited to all wrists and asserts itself as a new creation in its own right. While maintaining the emblematic large balance wheel, the Inventor Watchmakers entirely rethought this new movement construction so as to trim the dimensions without compromising performance in any way. The manual-winding calibre comprises 255 components, all crafted and finished in the Greubel Forsey spirit of the finest workmanship. It is endowed with a 72-hour power reserve ensuring chronometric performance by means of two series-coupled fast-rotating barrels – one of which is equipped with a slipping spring to avoid excess tension. 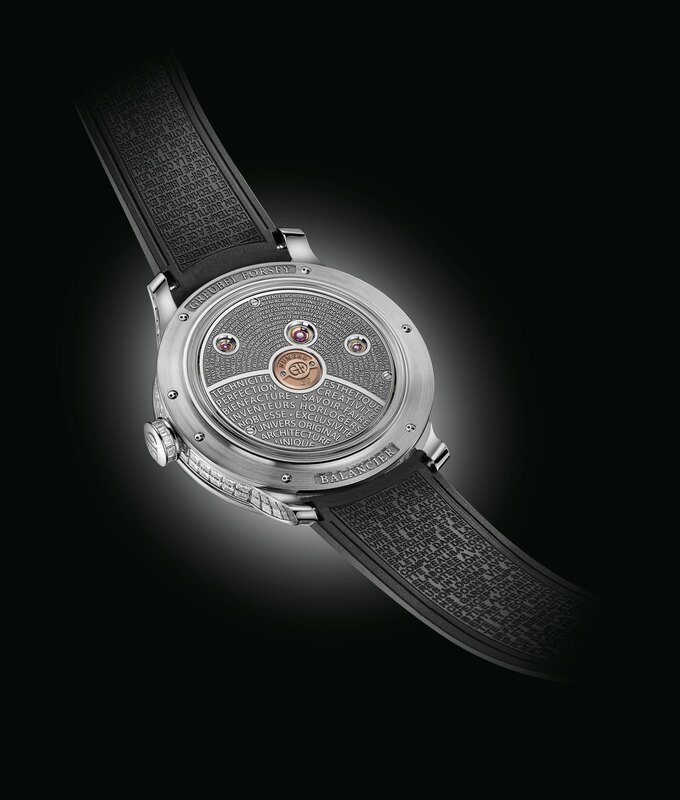 The movement is also equipped with a crown-activated ‘stop balance’ system enabling timesetting to the nearest second. The white gold case flows into three-dimensional lugs formed from geometry – a subtle and elegant expression of creative skill. These original volumes are accentuated by alternating finishes – polished bezel and lugs, satin-brushed caseband and caseback – creating a play on contrasts that has become a signature of Greubel Forsey timepieces. 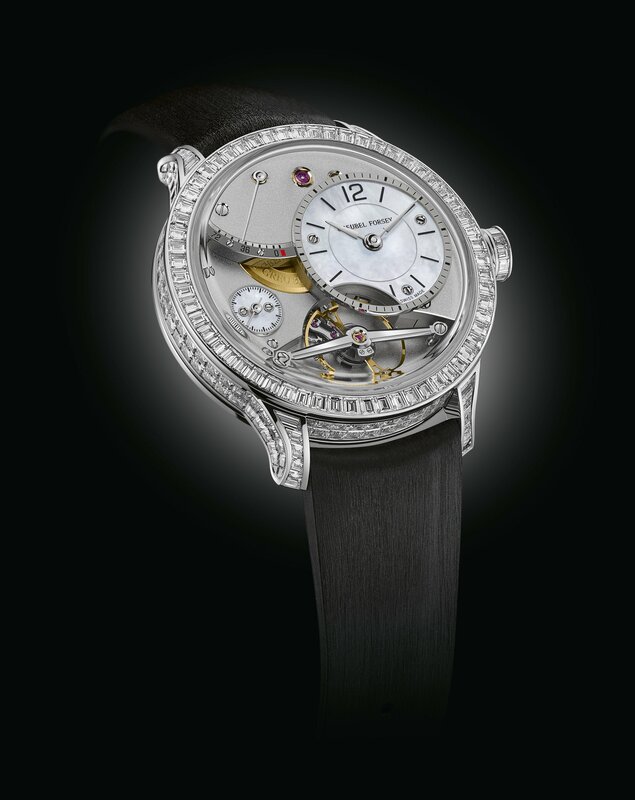 Greubel Forsey pairs the launch of the Balancier Contemporain with this diamond set edition becoming a sparkling sculpture where mother-ofpearl dials underline its elegance. This lustrous new creation stands out like the Balancier Contemporainfor its compact size and its exclusive balance wheel system. Its unique proportions are enhanced by the radiance of the diamonds where the bezel, case band, lugs and crown are all invisibly set with the finest IF / D-E quality baguette-cut diamonds. This diamond set edition is fitted with an alligator or rubber strap and the gold pin buckle or folding clasp with the handengraved Greubel Forsey logo is also invisibly set with baguette diamonds. Balancier Contemporain and Diamond Set Balancier Contemporain: a unique new combination of technical sophistication and aesthetic elegance, creativity and expertise, signed Greubel Forsey.